You may be comparing serviced apartments in Barcelona, if you find yourself so lucky to be travelling to this beautiful city for a work trip, or better yet, if you’ve decided to relocate here. Our serviced apartments are perfect for travelers looking for a place to live and to call home, instead of just a place to sleep. You can enjoy a high degree of flexibility in a serviced apartment in Barcelona. You can dine out or cook at home as you prefer, or even have the option to host friends and entertain, if you should feel inspired by the colourful produce at Barcelona’s famous food markets. Our serviced apartments come with fully equipped kitchens so that you have the freedom to prepare whatever your heart (and stomach) desires! Not to mention that serviced apartments in Barcelona typically have at least double the space of a private suite in a hotel, giving you extra freedom and privacy. This includes separate spaces for dining, working and resting. So you can spread out and get comfortable and productive, without having to worry about anyone interrupting you. Serviced apartments in Barcelona offer a homier feel with personal touches that can create a more relaxed atmosphere, making you feel more welcomed and settled in your new city. Especially if you’re relocating here from abroad with your family, it can make the transition a little smoother and give some normality and routine to your new life here – a home away from home. Now of course, the key in serviced apartments is the service! To give it that extra special final touch, all bizFlats serviced apartments come with a Concierge service that are on hand to take care of your every need. Before you even step through the doors, the housekeepers will be on hand to welcome you, and even provide you with recommendations of things to do in the neighbourhood and in the rest of the city. Should you be too busy with your work schedule and need your fridge filled? Right away! Need your business suits to be dry cleaned and pressed before your next meeting? Not a problem. Our housekeeping services will make sure your needs and wishes are catered to, and provide you with the best tailored and bespoke experience. 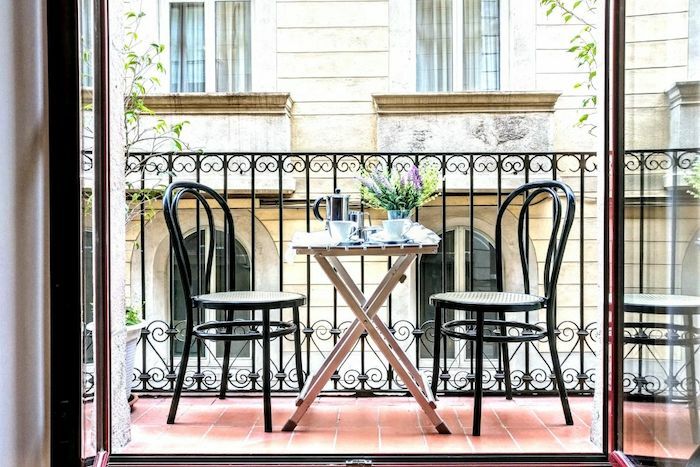 This large apartment breathes modernity and is perfect for music lovers, with its proximity to the Gran Teatre del Liceu, a temple of music with international recognition, plus Plaça Reial just moments away, plus a balcony to enjoy early morning breakfasts with coffee and a side of sunshine. A bright and spacious penthouse, located high up in the beautiful neighbourhood of Eixample area near Camp Nou, with the ultimate luxury of a private terrace to take in the views and fresh air, making it one of our most popular serviced apartments in Barcelona. To check the full list of our serviced please click here to visit bizFlats website and browse our full list of serviced apartments in Barcelona. With properties all over the city, there’s sure to be one that suits your needs. Which serviced apartment are you going to choose first? Find yours and let us know!